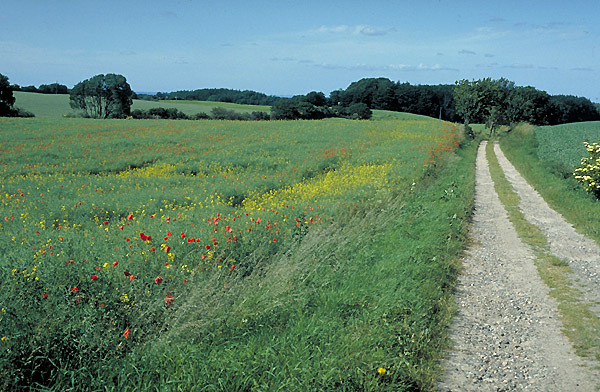 Most of Denmark is farmland and the danish landscape is a result of mans use of the natur since the Stone Age. The picture (Northern Funen) shows the well known danish landscape with crop fields, roadsides and -ditches, small forests and trees separting the fields. The fauna and flora in the farmland are very influenced by the way the fields are managed. Is there a change in this management it will result in a change in the flora and fauna too. The white stork is today extinct in Denmark and only breeds irregularly. For 100 years ago there were thousands ! The white stork found its food mainly in fields and meadows used for hay mowing - a practise that today almost has stopped. Several other species are going down in numbers due to changes in agriculture as Grey Partridge, Lapwing, House Sparrow, Brown Hare and all species of amphibians. The composition of the flora in the farmland has changed too. For 100 years ago the crop fields were rich in species of weeds, but many of these species has today disappeared due to use of herbicides and better quality of crop seeds. Many species of wild plants grew in the ditches and between the fields, but the number of species are much lower to day. But there will always grow some of the so called weeds among the cultivated crops.